William Hill offers a robust horse racing product with a strong focus on options and flexibility for the punter. The William Hill Race and Sports Book is available for players in Nevada, Iowa, New Jersey and the Bahamas. What horse racing events can I bet on? William Hill horse racing allows customers to wager on events all across the United States. The William Hill racing book has thoroughbred tracks, quarter horse tracks, harness tracks and greyhound tracks. 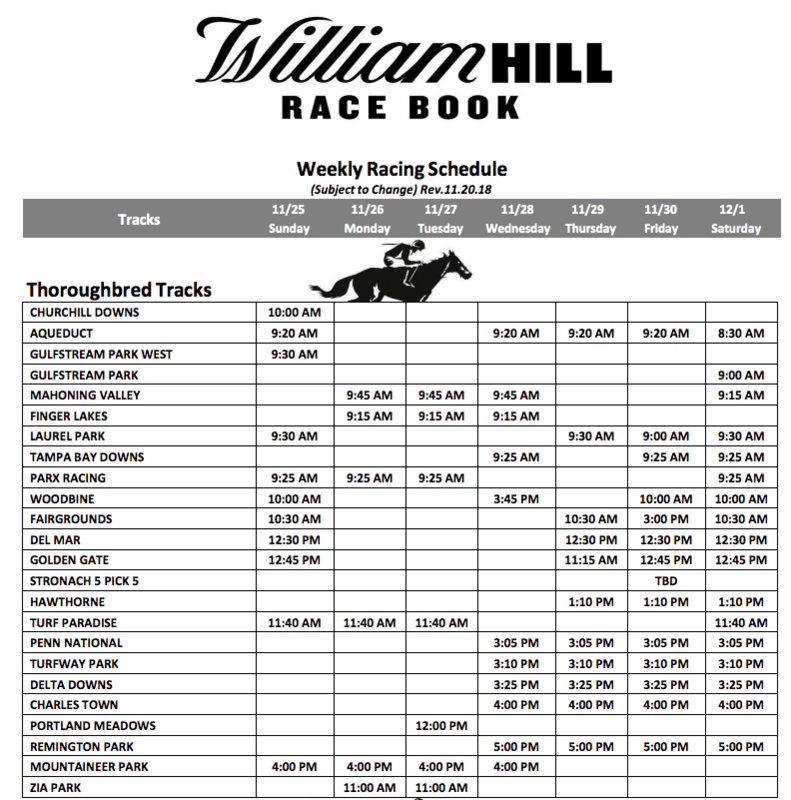 For the US horse racing schedule, William Hill Race book covers almost all races that take place around the clock. If that wasn’t enough, William Hill also offers betting on Virtual racing, which involves simulated races that punters can wager on day and night. Worth noting is that William Hill has a live streaming service available which allows punters to watch plenty of racing in real time right from their browser or within the William Hill mobile app. PLACE (P) -Your horse must finish either first or second, to collect the place payoff. SHOW (S) – Your horse must finish either first, second, or third, to collect the show payoff. DAILY DOUBLE (DD) – You must select the winning horses of two consecutive races designated by the track. The track will usually designate the first two races and sometimes the last two races. Daily Double wagers must be placed before the first race involved in the wager. EXACTA (EX) – You select two horses in one race to finish first and second in the exact order selected. This wager must be placed before the first race involved in the wager. TRIFECTA (TRI)– You must select the first three horses that cross the finish line in exact order in the designated race. SUPERFECTA (SFC)– You must select the first four horses that cross the finish line in exact order. Scratch Sheets – List of information needed to make wager for a track. Each track will have a separate sheet. Some of the information included are; saddlecloth number, horse, jockey, weight, track conditions, distance and wagering format for each race. Entry Horse – Two or more horses in the same race running as a single betting unit when there is a common owner or trainer. If one of the horses is scratched, you will still have a wager. Field Horse – Two or more horses in the same race running as a single betting unit. This results when there are more entrants than positions on the totalisator board. If one of the horses is scratched, you will still have a wager. This is also called the mutuel field. There are numerous multiples and other exotic bets one can place and more information on those can be found on the William Hill Site. William Hill Horse Racing offers a very extensive range of pre-race markets. In smaller meetings where the pools are not yet very active, William Hill still offers Starting Price betting options so punters can wager a decent time before the race. Most exotics and multiples are also available giving punters great flexibility in their pre-race betting. William Hill offers live betting on selected horse racing events only in Nevada. Real-world and online horse racing betting is also legal in New Jersey at specific, authorized locations so William Hill will probably also offer inplay horseracing in New Jersey in the near future. This somewhat new feature allows punter to place bets on certain outcomes after the race has started. As mentioned briefly above, William Hill offers a live streaming service for selected horse racing meetings. This feature facilitates the use of in play betting for users who don’t have access to the races via a tv. The fast-paced action live betting provides is second to none, and even though it is not available on all races, it is certainly available on most major meetings. Note that in some cases punters need to have had a wager on a race to stream it live. You can also place inplay horse racing bets on the Nevada Mobile Sports App. On Horse Racing meets punters are sure to receive the best available odds when betting with William Hill. The William Hill tote betting ensures that punters receive odds at least equal to, if not better than the tote odds. If you are like me, you don’t want to have accounts opened all over the place and prefer to pick 1 or 2 go to operators to wager with. In that context, William Hill does a very good job at ensuring its customers always get great value odds even when considering fixed price betting options. The fact is that William Hill’s size results in them taking in a lot of money on every race so they can operate at margins which result in punters getting better value. William Hill Race and Sportsbook offers many different promotions depending on which state you are living in. All users can claim $50 in cash as part of the William Hill promo code offer. In addition, the following promos are available to existing customers. Read more about how you can deposit money to place bets and withdraw your returns here. The William Hill Race & Sports Book offers you a way to earn even more from your wagers by entering the William Hill Rewards Club. With the Rewards Club card, you can collect points for any type of race or sports wager, then redeem those points for either sports play or other comps at your preferred William Hill location. You can join the Rewards Club for free and enjoy all of its benefits. William Hill has a strong focus on the horse racing segment with experienced management pushing innovation and value for customers. Overall William Hill’s offering on horse racing in Australia is second to none and it is no surprise that many serious punters make it their first choice.